When buying products made of plastic, do you look for ones that say BPA-free? Well it turns out that the chemical bisphenol-S (BPS), the alternative to BPA, isn’t necessarily safer when it comes to our health. New research shows that BPS can also disrupt the hormone levels in our bodies and can be detrimental to the developing brain. So what can you do? 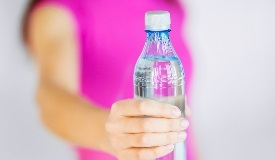 While it may be difficult to completely eliminate plastic products containing these harmful chemicals, there are some things that you can do to limit your exposure. Washington Post writer Amy Ellis Nutt shares some tips. Instead of using food containers made from plastic, opt for stainless steel. You can even buy reusable stainless steel bottles for water and other beverages. Choose unbleached wax paper as a safer alternative for plastic bags and plastic wrap. Switching to plastic-free cleaning products like vinegar and baking soda is also recommended. And whenever you come into contact with plastic items that may contain harmful chemicals, wash your hands after touching them. Here’s another Good for You tip: When possible, consider purchasing foods in glass versus plastic jars. Then after finishing a glass jar of peanut butter or tomato sauce, wash and use for storing other foods and beverages.